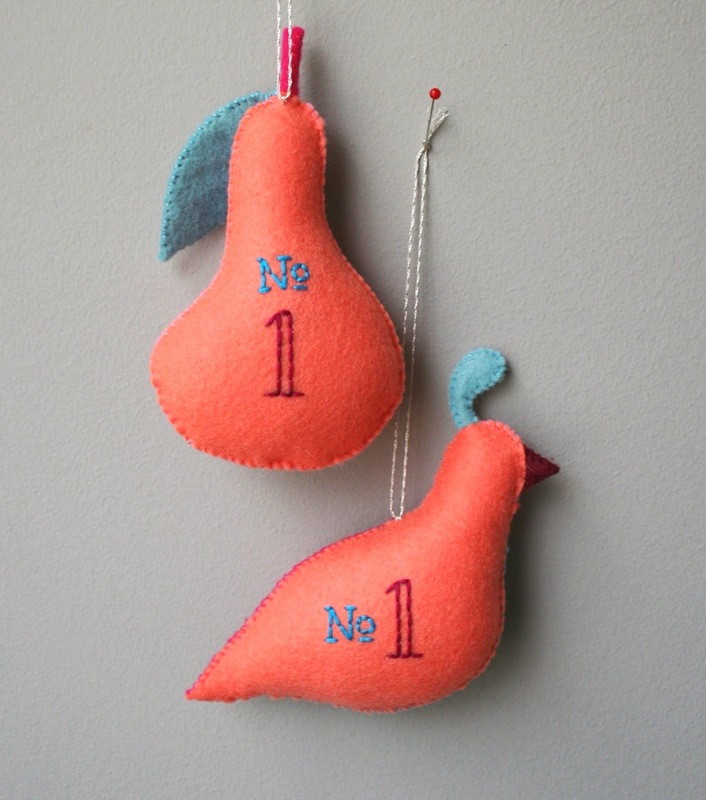 mmmcrafts: Partridge & Pear pattern is now available! 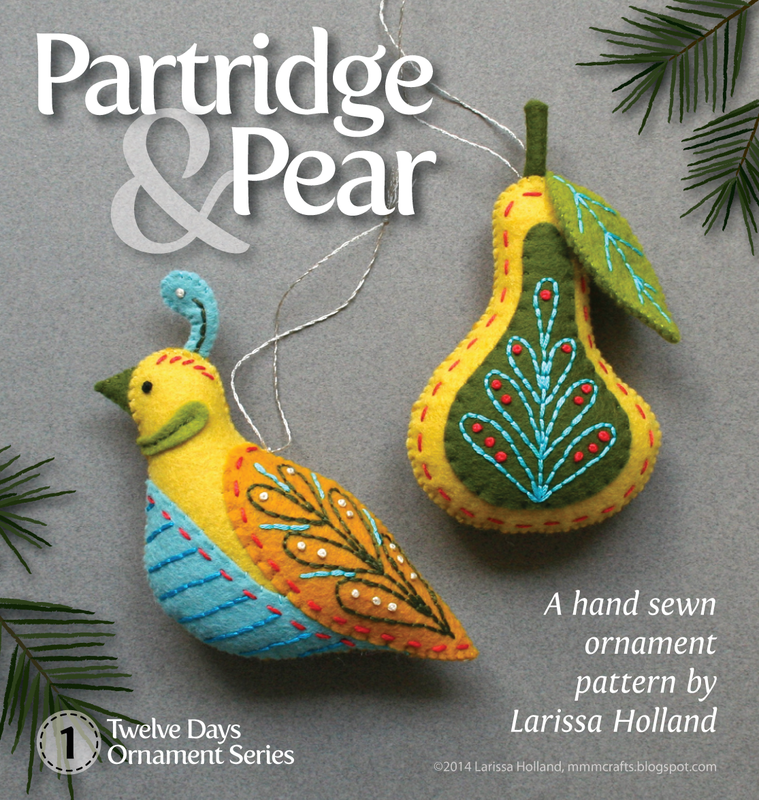 Partridge & Pear pattern is now available! The blog's been quiet lately because I've been feverishly working to finish this pattern. It's a bit later than I anticipated but still in plenty of time for lots of handmade pre-Christmas makery! This is the first of the Twelve Days ornament projects that I'll be releasing as they get done. I've worked out all the production kinks on this one so hopefully the other patterns will come faster as I go along. I'm really excited about this! 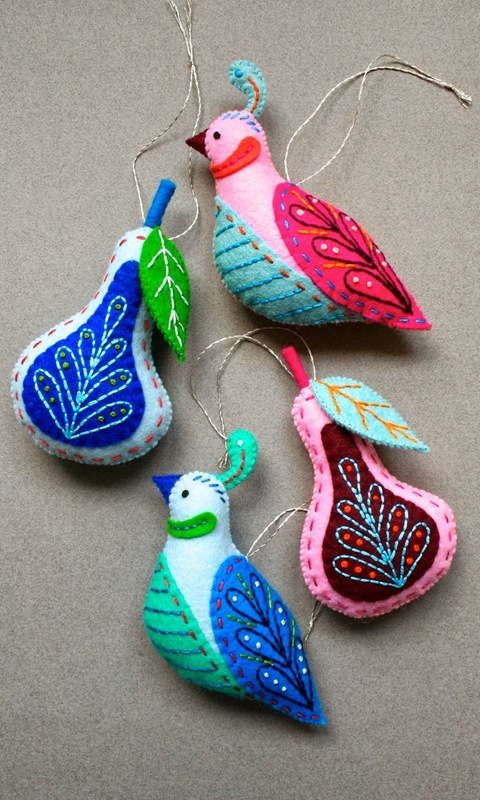 Make partridges and pears galore in whatever color scheme you like! I love being able to match any Christmas decor. 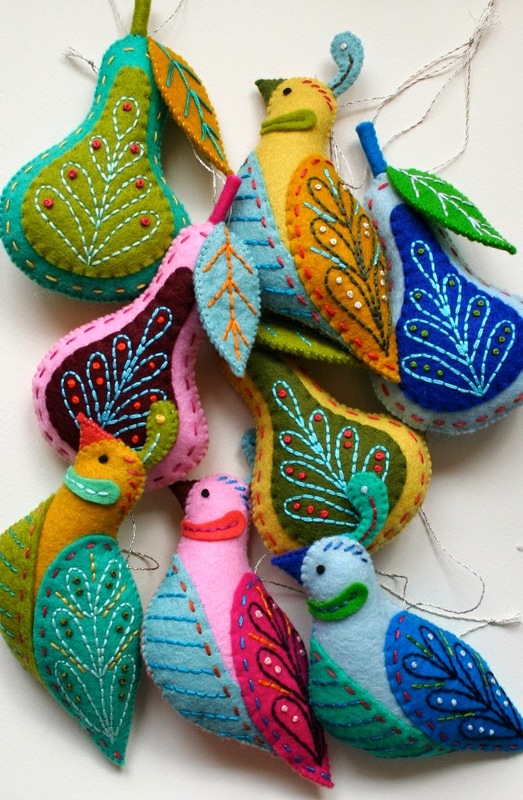 They make such a unique handmade gift that will look beautiful on a Christmas tree for many years. There is a No. 1 on the backs since this is the first of a series of twelve. You can also easily add the year or a name if you like, of course. So, basically you print my pattern pieces directly on the stabilizer, peel off the backing, apply it to wool felt and stitch the embroidery designs directly through the stabilizer. Once the stabilizer is soaked away you are left with a perfectly executed embroidery design on felt. No pin dot tracing. No guessing. No fading ink marks. No re-appearing ink marks. FANTASTIC. I know you are thinking, 'Wait a minute, you can't wash wool felt in water!' Oh, yes you can. 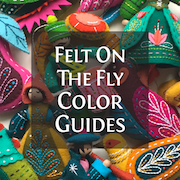 The key to this process is to pre-shrink your wool felts the day before you start the project by simply soaking them in cold water and letting them air dry. It won't change the texture or thickness of the wool felt if you do it that way, and the pre-shrunk wool won't shrink when you soak off the stabilizer. I've tested this with wool-blend (wool + rayon) and also 100% wool felt and it works equally well for both. Are you excited yet? You can purchase this instant download Partridge & Pear pattern PDF in either my Etsy or my Craftsy shops. Go to my listing to get more details on the pattern itself. I hope you enjoy it! I'm currently working on a couple of her ornaments and will be sure to show you when they are done too! Love this ! 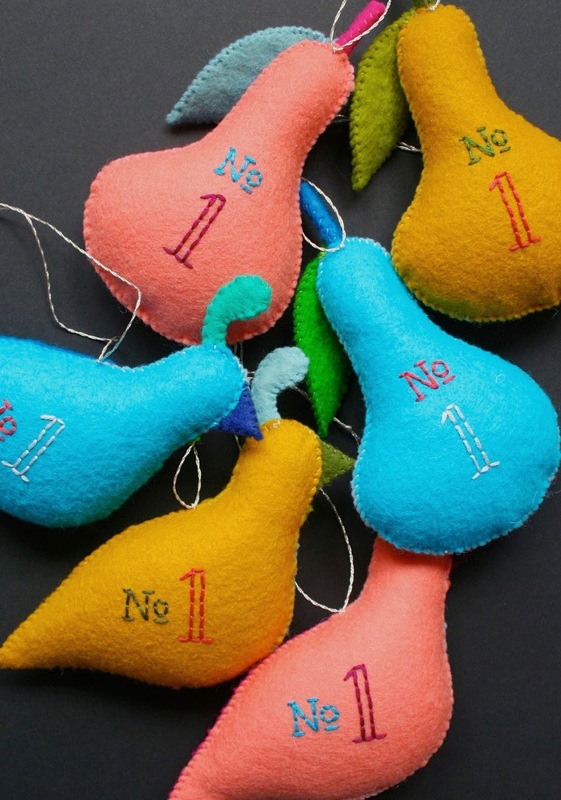 I am very excited to make all 12 and cant wait to start on the Patridge and Pear ! They are just beautiful ! Really like the numbers on the back. Such a good idea and they will make wonderful gifts. I love felt, love your beautiful work too! Are you planning to sell a set of all 12? 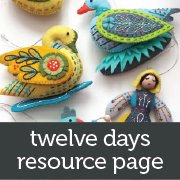 Hi, Theresa, yes, it will be a series of 12 patterns, one for each of the 12 Days of Christmas. After they are all completed (not sure when that will be just yet) I will be offering a set of all 12 projects at a special price. I'll also offer a bundle when I get to 6 completed. 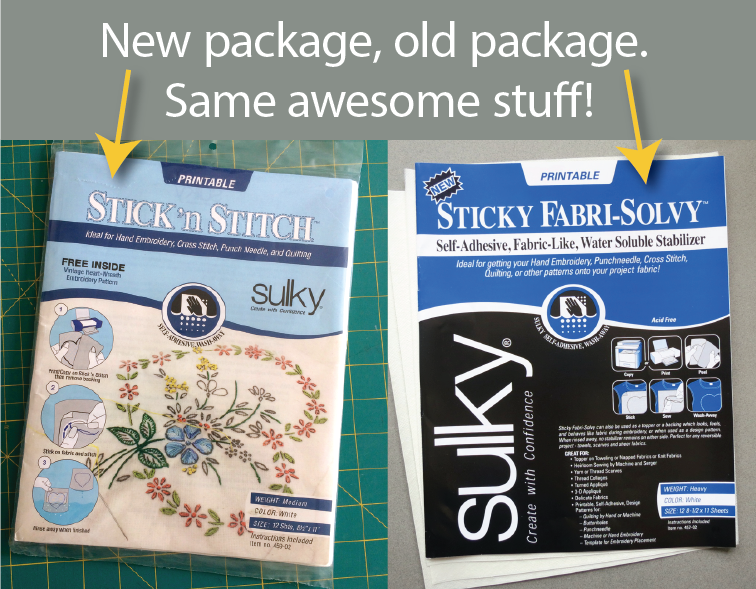 Did you wash the Sulky off the individual pieces before stitching together or did you wait until the end and wash the entire finished item? Hi, La Manosa, I wash as I go. 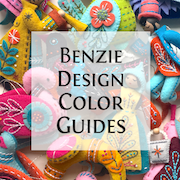 Can you use synthetic or other types of felt for this project? Hi, Kelley! I don't recommend using acrylic craft felts. They may melt or pill up and are not a very nice quality. I have never sewn with bamboo felts, so I'm not sure how they would do for this. Wool and wool blend felts are reasonably priced and work very well for these projects. I recommend you use those. I LOVE LOVE LOVE these and have almost finished the embroidery on first seven ornaments....can't wait for the last 5 so I can have a complete set for next year. Thank you so much. I am having a huge problem with washing away the Sticky Fabri-Solvy. I've followed your instructions carefully. (Pre-soaked and dried the felt, soaked the embroidered piece in cold water, rinsed in cold water). I've read everything I can on the Sulky website. Seems everyone raves about how the sheets just melts away, but I am left with sticky residue. Any suggestions? Hello, I'm sorry to hear you are having trouble! My first thought is make sure you ar using wool or wool-blend felt. Acrylic felt can turn the stabilizer into a gummy glue that won't come off. The other thought is perhaps your package of stabilizer has been exposed to too much heat (in shipping or other). I've never had problems washing it off. I use only 100% wool or wool-blends and I run my sheets of stabilizer through a laser printer. I hope that's helpful! It's hard for me to troubleshoot it. Ok. Thanks! I'll recheck my fabric. Sandra, here's an update. I've heard others suggest the trouble with rinsing away their stabilizer is their hard water! They suggest adding a drop of something called Basic H in the water or using bottled water for the soaking. Just finished my partridge and pear in golds and teals and I absolutely LOVE them. I'm going to do one a month to work my way toward Christmas.